The world's first and No. 1 best-selling 3D Pen: 3Doodler works by extruding heated plastic that cools and hardens instantly, allowing you to literally draw in the air. Completely safe and easy to use. Learning in a new dimension: 3Doodler Is a creative tool that enables students to learn and explore principles of Art & Design, Science, Maths, Engineering, and other subjects in fun and engaging ways. Bundles built for learning: Outfit an entire classroom with 3Doodler pens & accessories. Designed for Educational Institutions, 3Doodler Edu Bundles are the ideal complement for stem subjects. Free learning content and resources: The growing collection of Projects, Lesson Plans, Curricular Materials, and Design Challenges are available for free and downloadable in multiple formats. 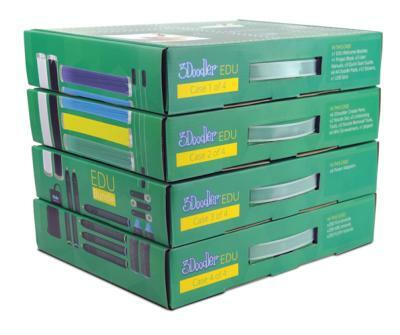 What’s included in each 3Doodler Create EDU bundle? Delivery is £10.95 + VAT.